Refinery29 published a fun feature we shot a few weeks ago. Featuring model Bethany Blakeman, we partnered up with style illustrator and author Lauren Friedman of My Closet in Sketches for, "How to Style a Scarf" based on excerpts from her new book, "50 Ways to Style a Scarf". Over some serious breakfast danish (read: CAKE FOR BREAKFAST) at editor Holly's studio, Lauren taught Bethany how to do the different ties we featured, and I photographed along the way. You can find the whole scarf tutorial feature HERE. To get more bang for our buck out of the studio, model, and awesome hair and make up by Lauren Clark, we decided to turn one shoot into two. While we were waiting for Lauren and Holly to decide on the next look, my assistant Katie and I took some quick fashion portraits of Bethany. For these (above), we used a reflector to take advantage of the amazing available light that pours into Holly's space from several skylights, and focused on capturing simple, evocative expression. For each look we shot for only about 60 seconds before Bethany had to dash off to change. I'm pleased with how these turned out, and love how simple and efficient the process was. Oftentimes, my favorite creative moments are the ones that happen along the way, in between the "real" shoots. 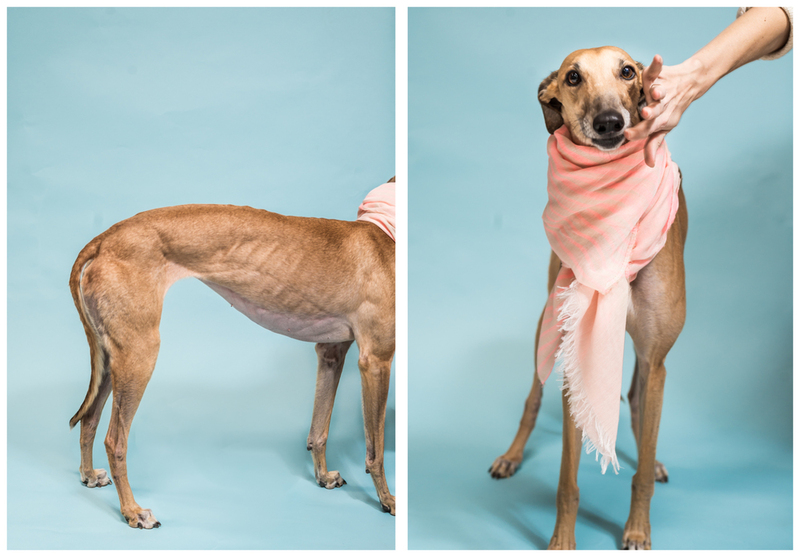 After the shoot was wrapped, we giggled and styled one of the scarves on Holly's beloved dog Lola. Lola wanted in no way to stand on the seamless paper with all those people watching, and it took patience and a great many treats to get a few shots. It was worth it. She looks dog-gone stylish (excuse the pun, I couldn't help myself)!